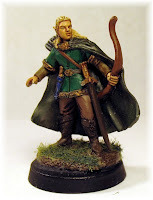 Here is a recently acquired miniature from Reaper. Reaper presented the miniature as a Stone Golem, but after talking to Nitia, I explained I really wanted it to be a living creature and not a stone construct. So she went to work and voila! I now have a really cool Royal Guardsman! 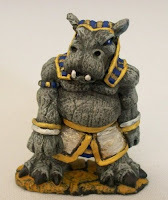 I've got a few minis (Some Basti & Anubi) from Crocodile Games with an Egyptian theme to them so this guy will fit in perfectly with them. 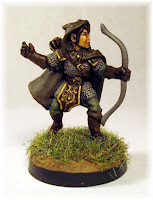 Here are a couple of Reaper elves painted by Don Moss. He was quite fond of playing elf rangers, so both of these wound up being used by him at one time or another in our games. Both of these minis saw use in our Castle and Crusades games. Updates will be scarce for a short while, I'm actually getting to take a vacation!! The Battle with Forth Ed! 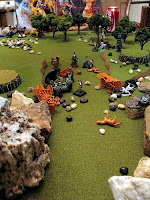 The culminating battle from the C&C Campaign I ran awhile ago. After tracking a particularly nasty Troll known as "Forth Ed", in the wee hours of the morning our party finally found him at the sight of a caravan that he had just massacred. The brave halfling knight Sir Bungo and the dwarf fighter Glorin move up to engage the enormous Troll. Meanwhile the other party members move into position. Using strategy, tactics and alot of luck the party press the battle! Tally the druidess unleashes a swarm spell that distracts the troll and hinders his regeneration. While Petra the gnome cleric moves about healing the wounded. 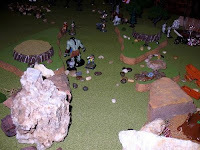 Somehow, they manage to bring the troll down, but the fights not over, he's regenerating! As a new day dawns, they quickly set fire to the troll, emptying every flask of oil they have, daring to not pause for a minute, they are all battered and exhausted, if he is allowed to get up, they may not survive another round. The party is victorious!!! Somehow they have managed to defeat this horrific opponent! The bards will long sing of this glorious battle!! Anyone need a little healing?? Here's a couple of clerics. You never know when your gonna need a bit of healing after a hard day of dungeon crawling. The current campaign has involved alot of work for the Church of Pelor and recently the Church of The Raven Queen, so I'm sure these minis will see alot of use. 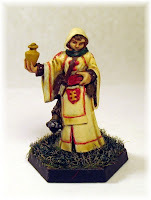 Originally the male cleric mini was used by Don to represent his character in a Castles & Crusades Campaign I ran for awhile ...Well actually it represented two of his characters. Brother Thomas and then when he died Brother Thomas' brother Brother...oh now I'm getting confused. Anyway both are Reaper miniatures painted by Don Moss. Just a quick little update this morning. I meant to add this with the original front shot the other day. Here is a backside shot of the Swamp Troll, this shot really shows off the scaling effect Nitia painted, as well as the "snack" attached to his belt. "300"... oh well ok how about "1"
After I saw the movie 300, I had to get this mini from Reaper. My friend Don Moss was nice enough to paint him up for me. I think he did an awesome job! I can't reveal too much just yet but this guy will have a part in my Campaign. More to come! 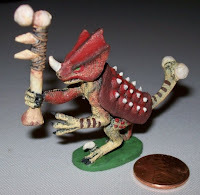 Here is a Dinosaur warrior miniature I got in the discount bin at my FLGS awhile ago, not sure about the manufacturer. This was painted by Nitia, I didn't give her any painting guidelines, just told her to "have fun" with him. Needless to say, I'm quite pleased with how he turned out. The penny is for scale reference. 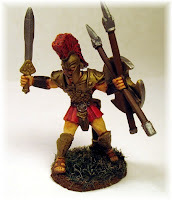 As of yet, I haven't decided how this fellow will be used in our campaign, but I do like the mini. If I were playing in the Forgotten Realms he could work as some type of Saurial. Hmmm....things to ponder! Here are a couple of Reaper minis recently painted by the very talented Nitia. The bigger of these two Mushroom Men (Myconis the Myconid) has already made a cameo appearance in the current campaign. He showed one of the players (a Dwarf Cleric of Moradin) a secret back entrance to a ruined Keep (Morgen Keep), wherein the rest of the party was in an epic battle with a particularly nasty demon! The priest arrived just in time to make a big difference in the battles outcome. For those of you interested in seeing the full view of the mini featured in my profile picture. Here ya go! 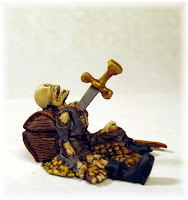 It's a Reaper Miniature painted by Don Moss, he also did a bit of custom work on him, he smoothed out the shield emblem and added some putty to lengthen the hair in the back. 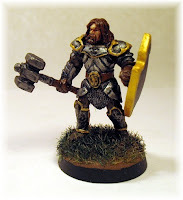 I used this miniature for my character Ulf Gravenstone, in a one shot Castles & Crusades game I got to play in, had a blast. This is definitely one of my favorite minis! What? you say this isn't a henchman?! 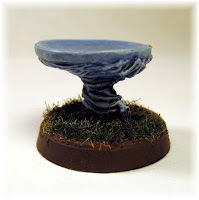 Of course it is, how about a Tenser's Floating Disc! I got these painted up, cause you never know when the players might want/need to hire some extra help or some such. Last session, they acquired a Ritual for Tenser's Floating Disc, so the mini may just come in quite handy. 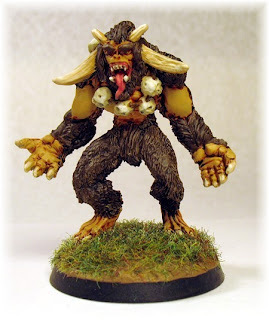 Here's a Reaper Marsh Troll miniature painted by my friend Nitia. I think she did a great job with the fish scale effect on its skin. I've got several Troll minis, but this one is extra creepy to me. I've got plans for it in my current Campaign. Here's a great mini from Lance & Laser that I picked up for quite a discount (I think it's OOP now). Painted by my friend Don Moss, he's an incredible painter and modeler. Sadly due to shedules we don't get to game together anymore, but we still chat from time to time. I've got several other minis that Don has painted for me that I will be posting here as time permits. I think this particular miniature is based on a monster from the 3.5 Penumbra Beastiary, but I'll be statting it up for my own nefarious purposes! My players will definately be encountering this beastie at some point! 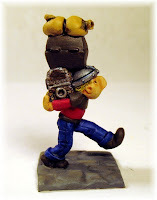 Here's a classic Grenadier miniature from the late 70's. It was from their Swamp Dwellers boxed set. Painted by my friend Nitia. I asked her to go with a kind of metallic scaled effect. I think she did a great job! The mini is quite heavy, old school lead don't ya know! I haven't had a chance to use it in my games yet, but I'm definately looking forward to unleashing him upon my players! Well as a young lad in the very early 70's, an older boy named Jeff lived up the road from me. He had a ton of the coolest plastic monster toys. They were about the size of army men. I thought they were awesome. You couldn't buy them in stores, his mom apparently had bought them at a carport sale. I was so jealous. He had this cool back porch on his house that didn't go anywhere...no door just a big concrete stair. He would spend hours building castles for his monsters. Moats, walls, pits. As a youth of 6-7, I was mesmerized. I was too young to "play" of course, I mean he was 11, way too mature for the likes of me. But from time to time I was allowed to come over and see what he had built. A few times he even let me pick up some of the monsters. I vowed then that I would get some monsters of my own! My grandmother heard my pleas and scoured the local garage sales to find me some monsters of my own. She was the best grandmother a kid could ever ask for. One day she came home with a big grin... She presented me with my very own green skeleton!!! I was on cloud nine! I immediately raced down the street to show Jeff my new acquisition. He took one look at my GREEN? skeleton and laughed. Said that a green skeleton was silly. Never mind his wolfman was purple..... I was crushed. I walked home. Clutching my green skeleton. It might be green but it was mine and Jeff didn't have a green skeleton! That skeleton fought hordes of army men, Vikings and even survived the Cicada (Shell) invasion of '76. I never got anymore of those plastic monsters. Star Wars came out and I became an action figure nut. Then something changed....My cousin came in from California and showed me this new game; Dungeons and Dragons! It was in a box, had a cool red dragon on the cover. We set down and played, or tried to. I made up a dwarf and died. It was awesome!!! He told me that people used little metal miniature monsters with this game. I got so excited. 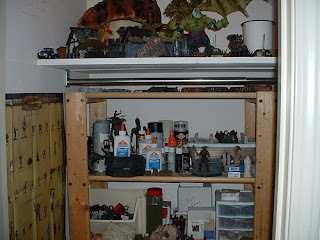 Recalling Jeff's plastic monsters! Unfortunately no store in my area carried them. My wonderful grandfather took me all over the city looking for them. None could be found. My cousin and Aunt would send me some for my birthday/Christmas etc. but my collection was very slow in growing. Fast forward. My grandparents passed away several years ago I'm now way beyond my youth with children of my own but somehow I'm drawn back there. I've got my monster collection now, all kinds of monsters! They're not plastic, no they're little 28mm metal nasties! I'll be featuring many of them on this blog. My wonderful wife is letting me convert the bonus room into a game room. I think I just might have to paint one of my skeletons GREEN! Think I'll call him Jeff! Dedicated to the memory of my incredible Grandparents! They were indeed THE Greatest Generation!! Welcome to my little corner of the web. This site is a work in progress but will contain all kinds of goodies from my game table. 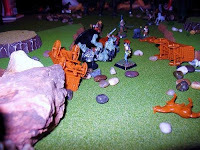 I'm an old school gamer (especially D&D and Gamma Word) from way back, so alot of gaming stuff will find its way into this blog, but you might come across some other tidbits here and there as well. So sit back and enjoy.